Because housing is a human right, and homelessness hurts all of us. San Francisco has the opportunity to center progressive politics by voting Yes on C to help house and support our neighbors experiencing homelessness. This measure addresses the affordable housing and homelessness crises on so many important fronts, including: building new housing for those who need it most (Yes to more affordable housing!) and protecting vulnerable San Franciscans who are at risk of becoming homeless from losing their housing in the first place. And the best part? Prop C was created as a comprehensive plan to address all aspects of the homelessness crisis by those who know it best, including people who have personally experienced homelessness and those who work directly with folks who are homeless. Prop C is a bold and progressive ballot measure that plans to tackle homelessness in San Francisco. The premise is simple – a small tax will be applied to all businesses earning more than $50m in revenue per year. This accounts for 1% of San Francisco’s businesses, and is a gross receipts tax. With more than 7500 homeless residents in the city (most of whom had housing in San Francisco before they became homeless), San Francisco accounts for more than 1.23 percent of all homeless people living in the US. In a city where the waitlist for a temporary shelter for 90 days is 1000 people long, it’s clear that radical action needs to be taken by local government to provide greater support and housing for those without homes, and Prop C is the radical action we’ve been looking for. According to estimates from the controller’s office,the tax would generate up to $300m a year. The tax would be applied to all businesses with annual revenue of more than $50m, which is between 300 and 400, and these taxes would almost double what is currently being spent on tackling homelessness in San Francisco. Half of the money raised through the tax will specifically be spent on building affordable homes, which is a huge deal in a city with such extreme housing inequality and with such a desperate need for more truly affordable housing. Another 25% of the funding will go into mental health, and drug addiction services, 15% will go towards prevention, and 10% will go into clean streets. This will be overseen by the Mayor’s office, and has inbuilt financial accountability. This handy video helps to break down some of the myths the opposition has been creating. (Like, do they even have a plan?? Yes, yes they do, and it’s a great one). San Francisco has a history of treating the homelessness crisis with punitive measures. As Christin Evans, owner of The Booksmith, writes, “In the last 20 years alone, we’ve banned panhandling (Prop M), banned tents (Prop Q) and banned sitting on the streets (Prop L) not to mention taking away financial benefits (Prop N, Care Not Cash). And all of these laws have gotten us where? Take a look at our streets right now and it’s clear that if we’re not housing homeless people than we’re not addressing homelessness”. This is the most hopeful measure we've seen in a long time, that's really working to create the world we want to see, and address the housing problems we are facing at the scale they need, so Vote YES on Prop C on November 6th! Seriously?! Because we should always, always, put people before profit. Marc Benioff, Nancy Pelosi, Dianne Feinstein, YAH!, the Coalition on Homelessness, Glide, the San Francisco Democrats, St Anthony’s, will.i.am, it’s a brilliant list and you can see it in full here. San Francisco Mayor, London Breed. Jack Dorsey, of Twitter and Square fame, Stripe, Lyft. It's a fun bunch of wealthy individuals, corporations, and politicians deciding that the needs of real human people are less important than San Francisco being home to some very profitable corporations. 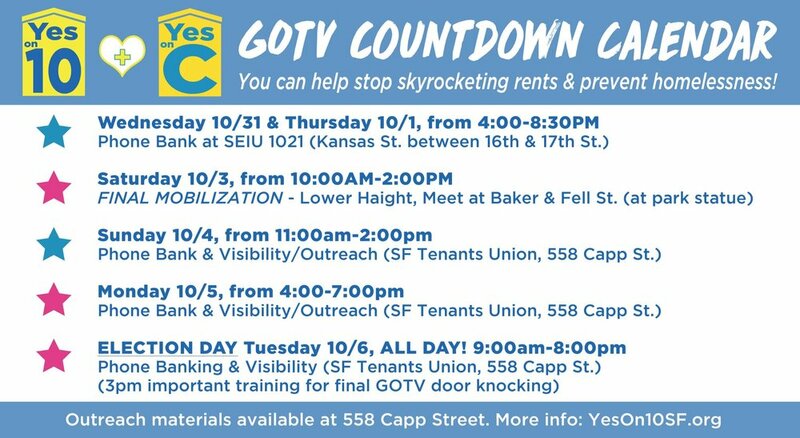 There are also actions in Dolores Park, and a few other spots – check out Yes on C - Our City, Our Home for more info about ways to get involved. Stabilizing vulnerable residents is an essential part of addressing our affordable housing crisis. Prop 10 is a key tool for stopping displacement, and would be a huge win for housing justice. Let’s start at the very beginning. Prop 10 is a measure that seeks to overturn a 1995 state law named Costa-Hawkins. I’m glad you asked. Costa-Hawkins was introduced in 1995 to place certain limitations on rent control in California. It prevents cities from enacting what is known as “vacancy control,” or limiting how much a landlord can raise the rent for a unit once a tenant moves out. It prevents cities from establishing rent control—or capping rent—on units constructed after February 1995 (or whenever the city’s rent control law was passed). It exempts single-family homes and condos from rent control restrictions. It’s worth noting that Costa-Hawkins has had significant lasting implications for affordable housing in California. Doesn’t the Bay Area already have rent control? It does, but there are important caveats, many of which were implemented as a result of Costa-Hawkins. In effect, Costa-Hawkins froze our ability to expand rent control in important and necessary ways. In Oakland nothing built after 1983 can have rent control, Berkeley is 1980, and in San Jose and San Francisco it’s 1979. It also goes without saying that these pre-existing rent control caps disproportionately benefit older residents–younger tenants find it significantly harder to access rent controlled apartments, not least because landlords are able to raise the rent once a unit is vacated. What will the effect of repealing Costa-Hawkins be for California? Not much in the immediate! By getting rid of Costa-Hawkins, Prop 10 opens up possibilities and tools for cities, giving cities greater flexibility when setting rent control policies. But if Prop 10 passes, each city still has to decide what rent control policies are best for its community, and go through the process of passing new rent control legislation. Many cities may not even choose to change anything about their current rent control laws. Alright, you nihilist. This matters because California has the highest poverty rate in the US, and extreme wealth inequality. Why, when California is the 5th largest economy in the world (ahead of the UK) does it have such high poverty rates? A lack of affordable housing. In San Francisco alone, the average rent for a one bed apartment is $3,442 – this would require tenants to be earning $58/hr to afford average rent in San Francisco. That requires an annual income of more than $120,000. And that’s just in San Francisco – the state at large has an affordable housing crisis. Our inability to put rent control on any new units means that the amount of rent-controlled housing is always going down. We are losing rent-controlled homes every day (to demolitions, owner move-in evictions, and other legal and illegal means) that we can never get back. In San Francisco, for every two new affordable homes we build, we lose three rent-controlled units. In Los Angeles, 5 rent-controlled units are lost every day. For the cities that do choose to expand rent control legislation, the impact on the affordability and displacement crisis could be huge. Protecting and stabilizing vulnerable tenants through policies like rent control is a key part of a complete strategy for making housing more affordable and just (watch out for a coming blog post on the 3 Ps: Protecting tenants, Preserving housing, and Producing new affordable housing). Keeping residents in the homes they already have by stabilizing rents and preventing evictions is much cheaper and more impactful than building new affordable housing and helps protect existing communities that are currently under intense threat of displacement. And which communities are the ones facing displacement right now? Low-income and communities of color. Passing Prop 10 is a justice issue. This isn’t a measure that will finance new affordable housing, it is a measure that gives cities greater control over regulations around rent control. However, for cities that do choose to expand rent control legislation, they may choose to prevent landlords from raising rent on a unit once a tenant moves out (also known as passing “vacancy control”)–which will preserve the existing affordable housing we have, and offer more affordable housing to lower-income residents and working families. Who is in favour of Prop 10? It’s a massive list of organizations! Funnily enough, it’s very well supported by affordable housing groups (including YAH!) - as well as labor unions, politicians, and local governments (among others!) The City of San Francisco has come out in favor of it, as has Oakland and Berkeley. No surprises here, but landlords, real estate investors, and their lobbyists! You can read more about who’s backing them here. Something that is important to note is that corporate landlords have been funnelling millions of dollars into the No on Prop 10 campaign. Where did they get the money from? Their tenants. It’s been a long time since the 1980s, I think we can all agree that “Greed is good” is a flawed system to live by. Won’t this just encourage landlords to raise the rent ahead of the election? Frustratingly, yes. There are many examples of this happening, that are being tracked. Doesn’t this disturb the democratic process? Why yes, yes it does. It’s not so much a case of voter intimidation, more that tenants are being punished before they’ve even had a chance to vote. vote Yes on Prop 10! If you think the rent is too damn high, vote Yes on Prop 10! There is serious opposition from corporate landlords and their representatives (to the tune of $65 million), and we need to do everything we can to get the word out. If you can, phone bank, join a mobilization, do a lit drop. Be part of the democratic process! YAH! Will be co-hosting a mobilization this Saturday, October 27th, at Precita Park. Come through and spread the word in Mission & Bernal Heights!